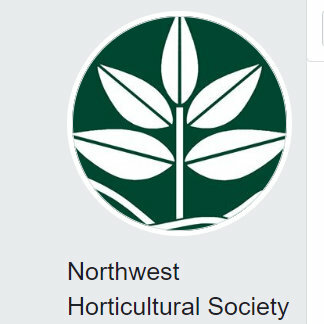 I recently had an unexpected opportunity to visit one of my favorite places, Rare Plant Research in Oregon City. They were open for a day in June…unusual because they normally only open to the public 1 weekend a year, in May. This was a great visit for a couple of reasons, mainly because went with a friend who had never been. I’d gotten a bit jaded, having walked through these greenhouses each spring for the past several years I’d gotten used to seeing the strange and the beautiful. To be there when someone else sees it for the first time was really fun. This visit also stood out because it was later in the season, the leafy tropical things were the show-off’s this time rather than the spiky plants. The Eucomis, or pineapple lily’s were blooming. This spotty Eucomis (Eucomis vandermerwei 'Octopus'?) was still holding its blooms pretty tight. Someone (MulchMaid was it you?) told me about propagating Eucomis with leaf cuttings. Here we have a visual of it in progress; I think I will have to give this a try. That fabulous Furcraea and the turquoise pot would be mine. So many colorful leaves! This one is a Musa 'Siam Ruby' not all the leaves were split like this. Wouldn’t it be cool if they were? 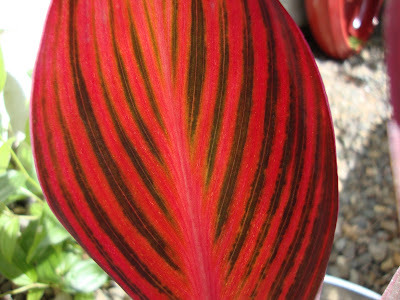 Canna 'Stuttgart' (below). I bought one of these years ago, and mine have never looked this good. Figuring out the right amount of light (to much and the leaves burn, too little and they stay small and insignificant) seems to be the trick. These were striking. 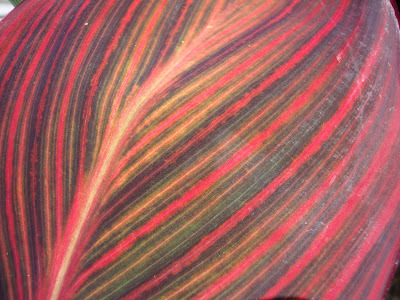 Just when I thought I’d overcome my lust for Cannas I had to run into these colorful green and red leaves. And this small plant caught my eye. I have no idea what it is but I really loved the little leaves on the edge of the leaves. 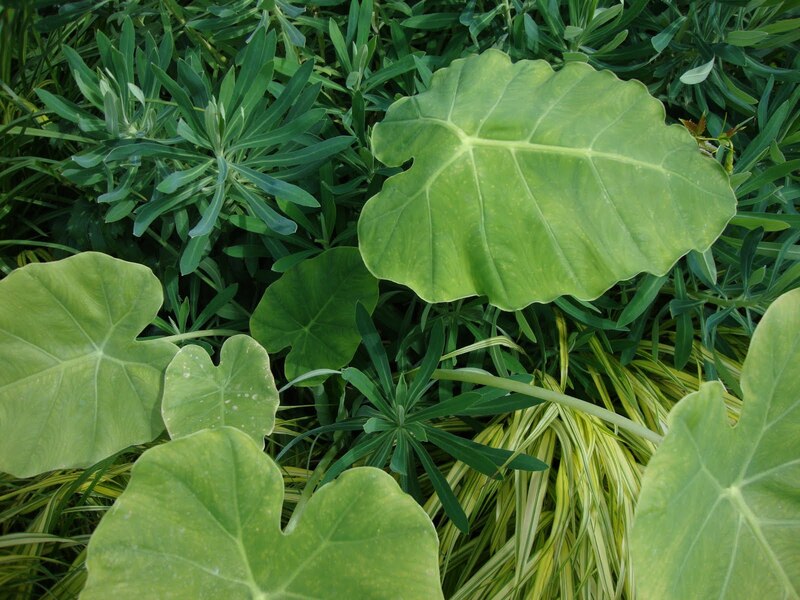 Have you ever heard of Araeococeus flagellifolius? It’s a Bromeliad! The most interesting thing about this plant though is right at the base…are these berries or seeds left from last years flowers? 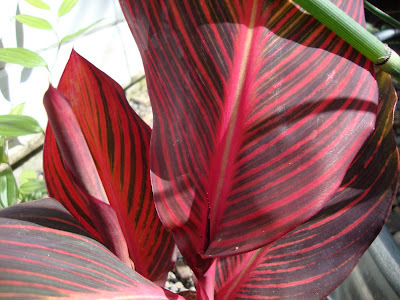 And because I couldn’t resist the shocking red of the Canna leaves, one of them came home with me too. 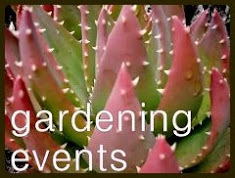 If you still haven't made it to Rare Plant Research they are now selling plants online...http://www.rareplantresearch.com/ and they've got another event coming up in July...a garden party! 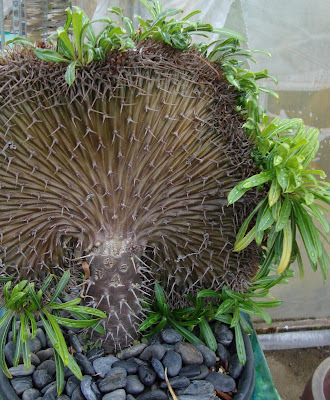 That succulent with the plantlets on the margins is "mother of thousands" and is really weedy. My coworker has it all over her yard but love it anyway! 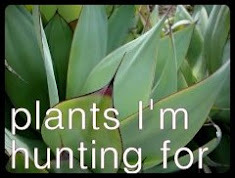 I checked out the rare plant website and will have to visit again when i have money... i a few years. I'll be mailing your plants tomorrow by the way. Lucky you, I've been meaning to get over there but I always seem to forget. Great photos! 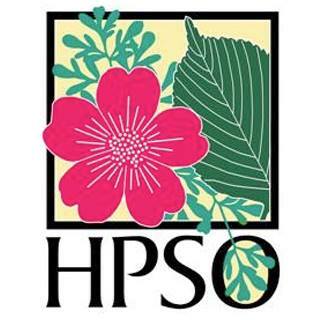 Loads of great plants-checked them online-some of them are quite pricey! 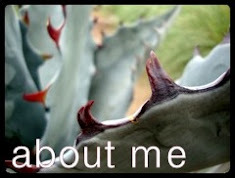 The plant is Mother of Thousands, Mexican Hat Plant, Kalanchoe daigremontiana. Don't know why its rare as it grows like a weed here! 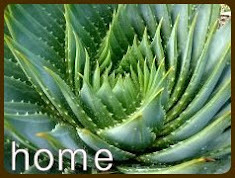 I LOVE that bromeliad--it looks like a curly bronze sedge. I think that "small plant that caught your eye" is Mother of Thousands (Kalanchoe daigremontiana). Wow! What a wonderful place to visit! I can see why you were taken by the red Canna leaves! I too covet turquoise pots! The plant with the baby leaves on the leaves is a Kalanchoe (the specific species is escaping me at the moment). It grows like a weed here in Tucson, because the little plantlets easily fall off the mother plant and root where they fall. The only thing that keeps it under control is how tender they are - usually most of them melt in the winter freezes. But if one is lucky enough to survive the winter, you get a beautiful bloom, colorful and chandelier-like. I love that Canna 'Stuttgart'. Sounds tough to get right, but, boy when it's right it is gorgeous! 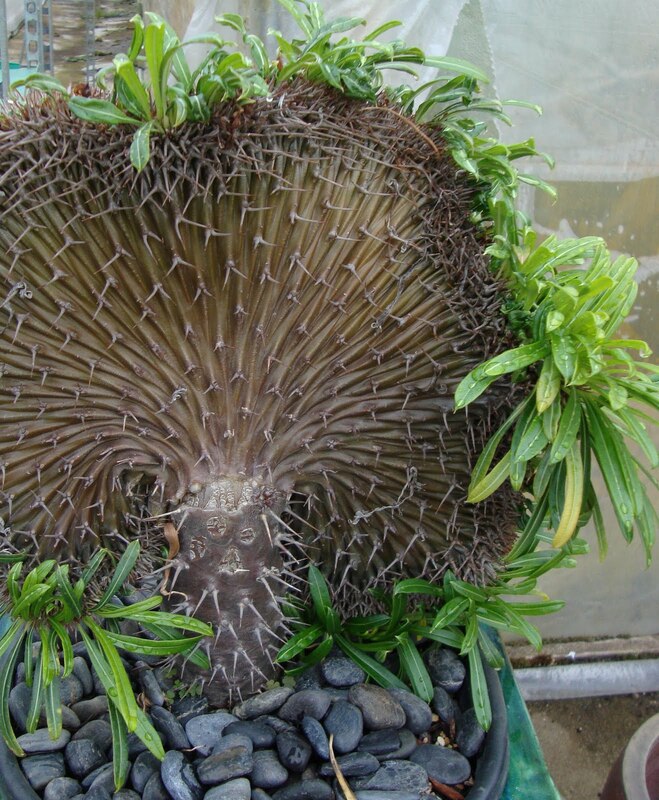 Araeococeus flagellifolius...wow! That's one for my list--love the colors. 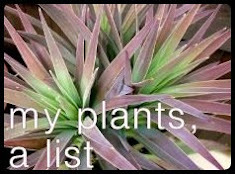 No, I'd never have guessed it was a bromeliad, but then I'd never guess Spanish moss was one either... With all those temptations you showed amazing restraint in coming home with just two plants. Want a blog topic? 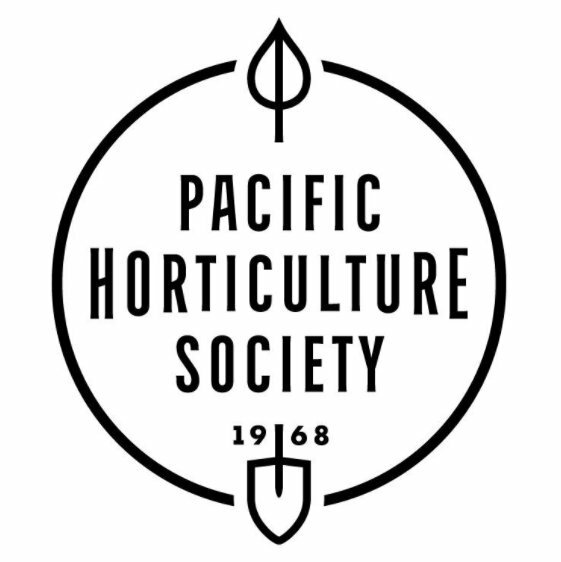 How about an Upcoming: "of interest to gardners" topic. I totally missed this RPR event. I like the Colocasia you brought home! Love may be blind, but it sure is prickly. Your first photo won my heart. I'm so sad I missed this. 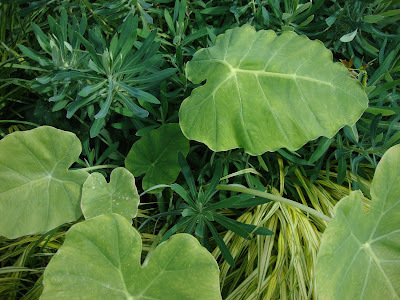 All my too-early planted colocasia are just barely showing up, and some of them aren't at all. One that's fully leafed out would hide all my garden bald spots. Remember that furcrea I got at the sale in May? I don't think it appreciated the cold rainy spring. I lost most of the leaves. Now it has a bad haircut. 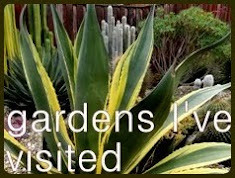 We were away, so I had to miss this open garden AGAIN! I might make the July soiree, but I see there's a gate charge. This newly-retired gardener wants to spend her limited funds on plants, rather than admission fees! Rainforest Gardener, I wish it were weedy in my climate! I have a feeling I would have to protect it come winter right? PortlandGardenGeek, you should really make it out there sometime, I doubt you will be disappointed. Nicole, I have a feeling the 'rare' in Rare Plant Research sometimes means exotic...and of course exotic only here in Oregon. Pam, of course when I was posting this I found myself wishing I would have bought it! Isn't that always the way? Les, now why did I think there were never freezes in Tucson? Sylvana, it sounds like pregnant plant was a very good nick name. James, well sort of (the restraint) when I was there in May I came home with 6 plants! Darla, cannas must be weeds in your neck of the woods? gh1, noted and definitely will take this to heart! Matti, oh yes! You and Megan should make a road trip adventure out of it! You of course will have to come over to the danger garden for beers on the patio! ricki, careful...that baby could do some serious damage to your heart! Megan, oh no! But you know what...mine too. It spend feb-early may in the basement (I bought mine from RPR at the YG&P Sale) and looked great. Once the may-june rain and gloom hit it yellowed up. I cut of at least 4 leaves. Hopefully with the heat next week both of ours will bounce back! Jane, CONGRATS on your retirement! I totally hear you about the fees. No good. Can I ask a question please ? Do you let the Eucomis leaf cuttings dry off or callous over before putting them into the compost to form new little bulbs ...or just put them in straight away ? I did not, but now you've got me thinking about it!